The Nigeria Police Force have been ordered to pay Charly Boy, the sum of N50million as compensation for violation of his rights during the 'Resume or Resign' protest which he convened on August 8, 2018. A Federal High Court sitting in Abuja has ordered the Nigeria Police Force, IGP and the FCT Commissioner of Police to pay N50 million to Charles Oputa, a.k.a Charly Boy, the convener of ‘OurMumuDonDo’ movement. Justice John Tsoho awarded the amount on Monday while delivering judgment in a fundamental rights suit brought against the Police by Charly Boy. He said the sum was a compensation for the violation of his rights to dignity of the human person, freedom of expression, peaceful assembly and association. He added that the Police should publish an apology to Charly Boy in two national newspapers. 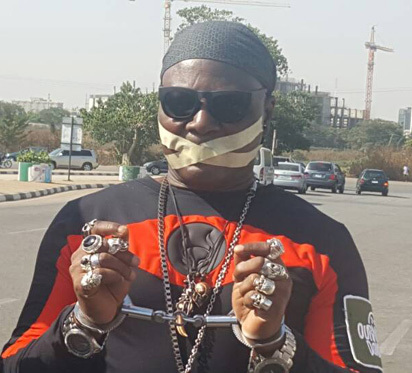 In a suit filed on March 29, Charly Boy had accused the police and their officers of harassing him and members of the #OurMumuDonDo campaign during the #ResumeOrResign protests. Charly Boy through his lawyer, Mr Inibehe Effiong, argued that the Police attacked the group during a peaceful demonstration at the Unity Fountain in Abuja. He argued that the act was an infringement on his fundamental rights, freedom of expression, peaceful assembly and association as enshrined in Sections 34, 39, and 40 of the Constitution of the Federal Republic of Nigeria, 1999 (as amended). Charly Boy, therefore, prayed the court to make a compelling order on the FCT police and their commissioner to publish a public apology to him in five national newspapers. He also demanded that payment of the sum of N100 million as general damages be awarded to the applicant as well as direct that N400 million be paid as exemplary damages by the police. Delivering judgment on the case marked as Suit No. FHC/ABJ/CS/343/2018, Justice Tsoho held that there was no evidence that miscreants invaded or stormed the premises of the protest as alleged by the police. On whether the Applicant is entitled to stage the protest, the court held that protest is a constitutionally-guaranteed right provided it is done peacefully. “The Respondents (the Police) need not exercise an uncommon aggression and mayhem to ward off alleged miscreants. “The law is that the court has the right to grant redress to anyone whose right is violated and the applicant is entitled to a remedy. “Relief four is granted and the respondents are ordered to publish an apology to the applicant in two national newspapers for violating his fundamental rights. “The sum of N50 million is awarded against the respondents as general and exemplary damages,’’ Tsoho ruled. Reacting to the judgment, Charly Boy’s counsel, Effiong described it as “a resounding victory for democracy, freedom of expression and peaceful assembly in the country”. “This judgment sends unequivocal message to the Nigerian Police that they have no power to stop or disrupt peaceful protests by Nigerians. “The police by this judgment cannot invent flimsy excuses to stop citizens from exercising their fundamental rights to freedom of expression and peaceful assembly. “I am highly elated by this victory for democracy,’’ he said.